This dress is based on a woodcut by Barthel Beham printed in Gotha in 1527. 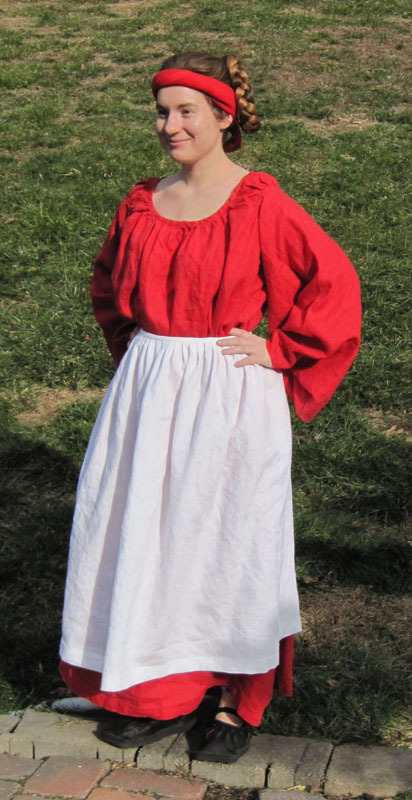 It’s a peasant dress which I haven’t seen anyone else try to recreate. The dress looks like it has Italianate sleeves by they are hold-overs from late 1490s German dress. It is unfitted. There is no waist in the garment. The waist is created by the apron. I made 3 versions of this dress. The first version was Christie’s red dress. Scroll to the bottom of this page. The next dress I made had a better fitting armseye and sleeve (pattern to come). 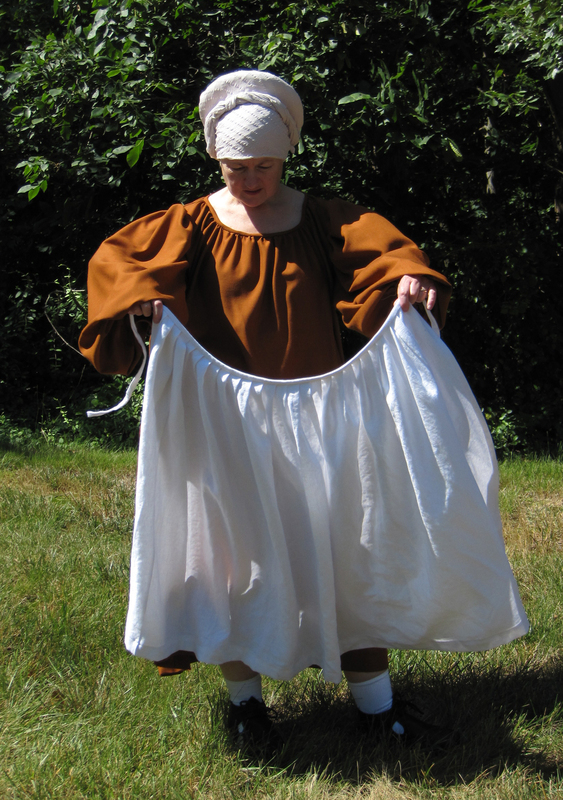 I made a dress out of green linen for Karin Taylor de Cameron in June 2014 for Pennsic. 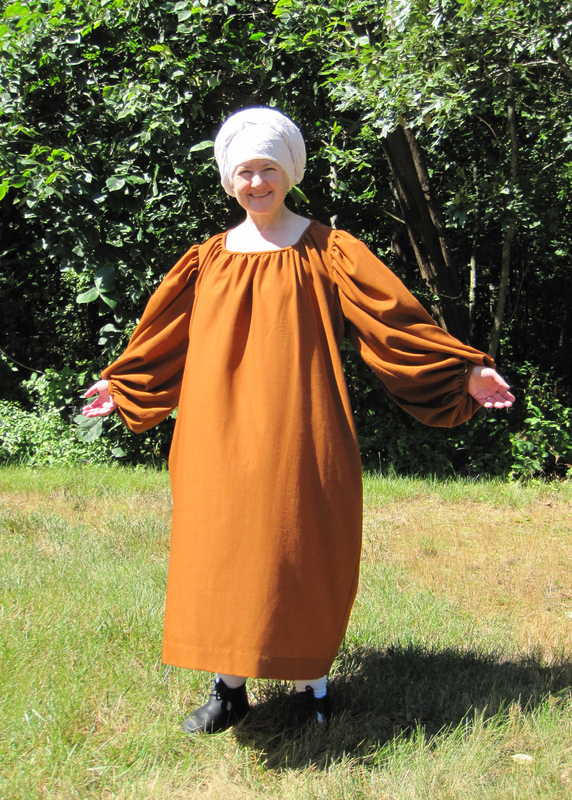 For the third version, I made myself the same a dress in rust-colored summer-weight wool. The new dresses are much shorter than Christie’s dress. Perhaps these are a little too short once the aprons are added. 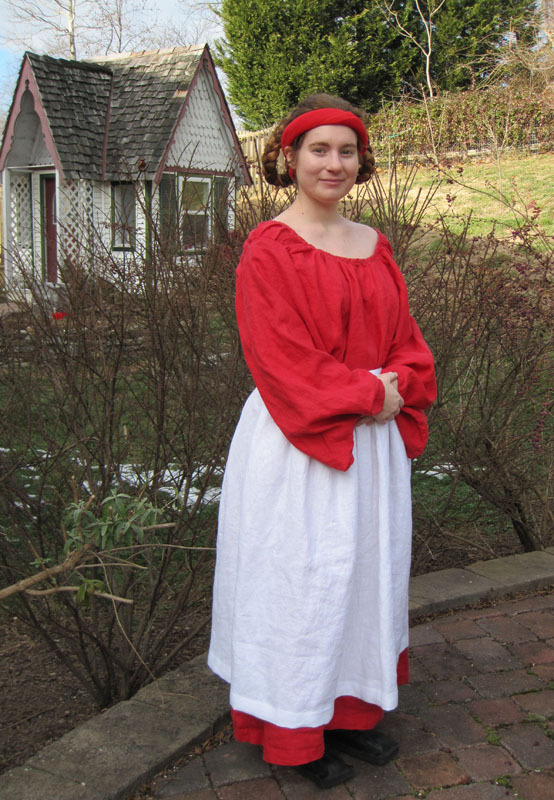 This dress is, without argument, the most comfortable dress I have ever worn for the SCA. 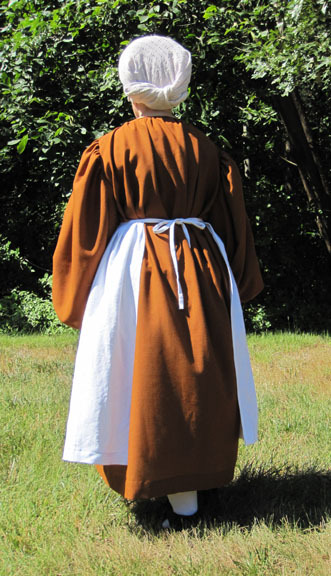 The dress below shows the apron worn high, just under the bustline. 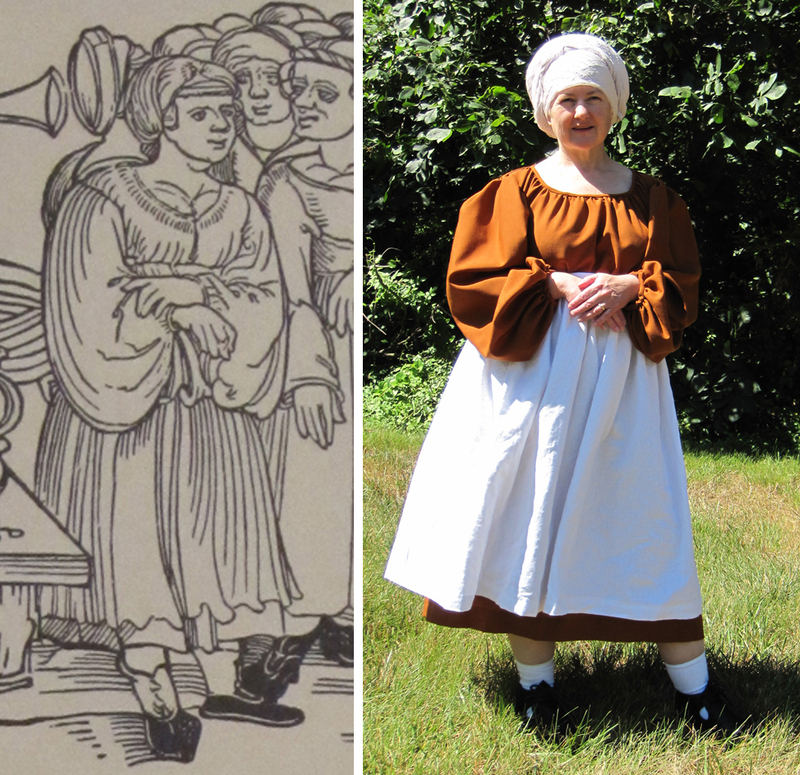 It makes you look pregnant but it is how the dress is worn in the woodcut. I am about 5 ‘2″ and size 12. This dress took 5 yards. The sleeves alone are 2 yards of fabric. The wool is from Burnley and Trowbridge. The apron took about 1.5 yards of linen from Gray Line Linen. The photos below, taken January 6, 2013, show the first version of the dress for Christie. The neck is finished with a piece of bias cut from the same fabric. The neckline is gathered into the bias and the bias is just turned under. That’s why it looks nearly invisible. 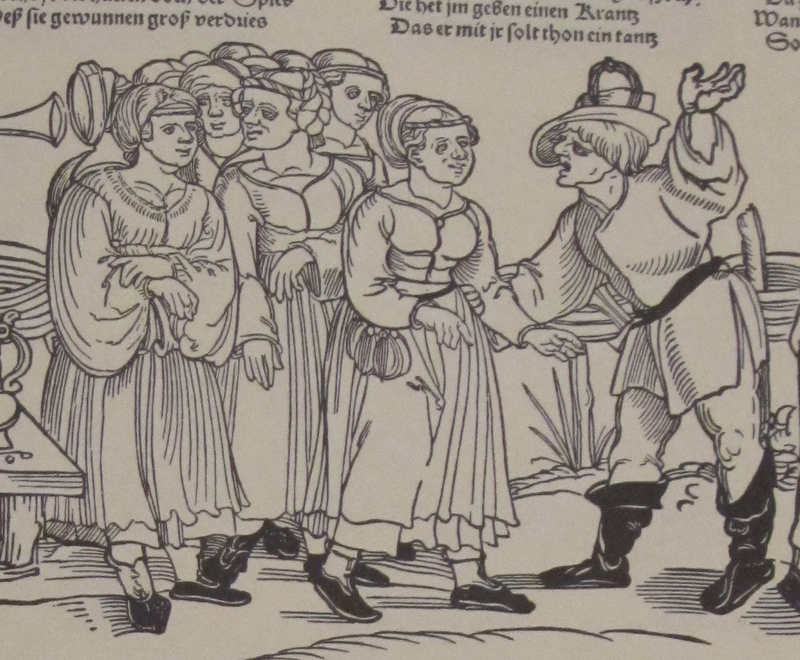 1527 Woodcut – The dress I’m recreating is on the far left, with the large, baggy sleeves. 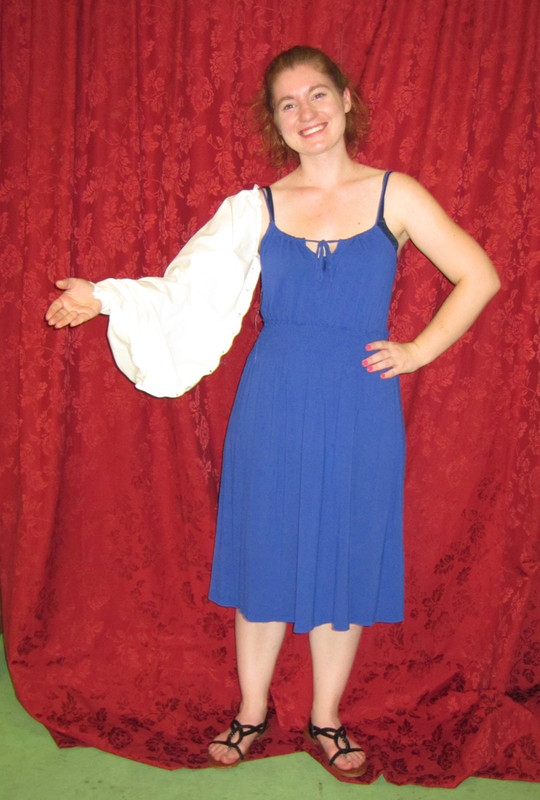 This is my model, Christie, posing with a first draft of the sleeve. I didn’t like the way this first dress fit. The neckline was too wide and the sleeves fit strangely where they joined to the dress. July 7, 2012 – Christie in her dress without the sleeves. 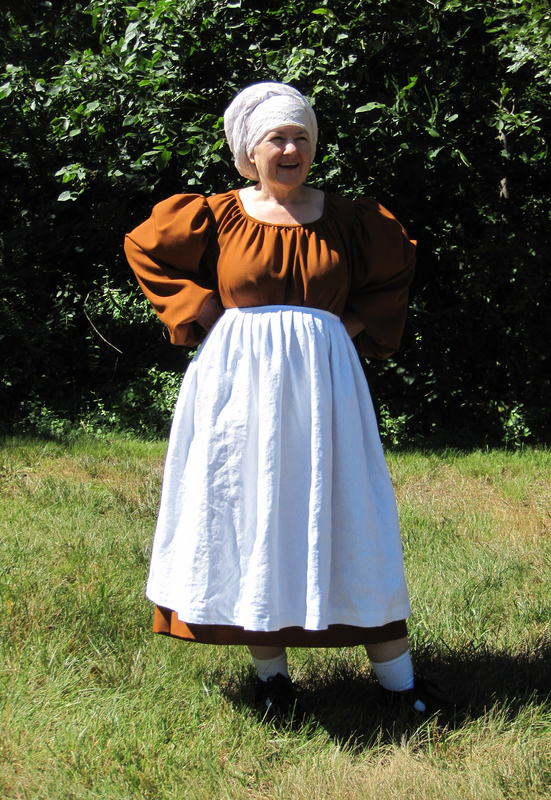 The waist of the outfit is created by the apron.